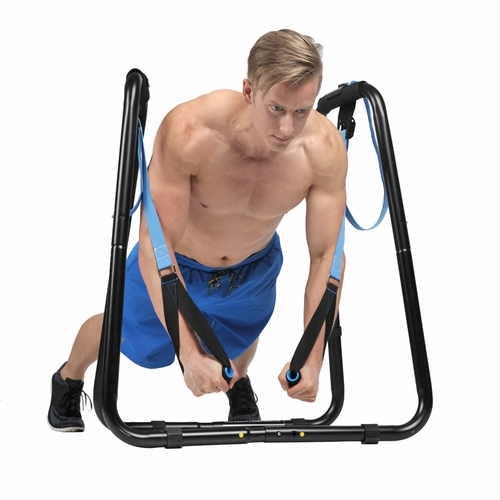 The number 1 Dip Station and Pull Up Bar accessory is newly redesigned for even better compound bodyweight performance. 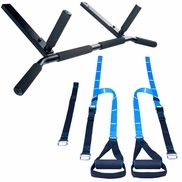 Building on the quick changeability between Pull Up Bar and Dip Station exercises provided by the rolled steel hook, the new Push Up Rings feature an extra-wide strap in brilliant blue and larger quick adjust cam buckle. At the handles our newest innovation, the lay flat strap, rests comfortably against your forearm so you can focus on form and reps. Fitness professionals love bodyweight exercises because they efficiently build lean muscle and support whole body functional performance. Our gym ring style Push Up Rings enhance the best bodyweight exercises with increased range of motion and expanded compound and unilateral movements. Push Up Rings add a new stability challenge to Push Ups making one of the best compound exercises even more effective. Push Up Rings also enable 'assisted' exercise variations so even beginners get rapid development, a lean muscular look, and the right performance for work, play and everyday life. Satisfaction is guaranteed, order your Push Up Rings today. The Ultimate Body Press Push Up Rings use an extra wide strap and oversized cam buckle for rugged durability and the high density foam over rigid core grips stays comfortable through your toughest workouts. The best trainers use bodyweight exercises to get the results you want without massive gym machines that isolate individual muscles. Your body chemistry kicks into muscle building high gear when you activate whole groups of muscles in single movements called compound exercises. Compound exercises like the Ring Push Up, the Pull Up and the Body Weight Row rapidly add lean muscle to the chest, shoulders and arms while also toning your core for real-world functional strength that makes you feel as good as you look – everyday. 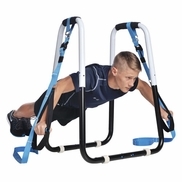 Beginners looking to get the most out of bodyweight exercises use Ultimate Body Press Push Up Rings for Assisted Pull Ups and Body Weight Rows. The assisted exercises work the same compound muscle groups as the full variations with reduced resistance so you can complete full sets right from your first workout. Push Up Rings are ideal if you are working up to your Pull Up for the first time or if you are working to rediscover your best level of performance. 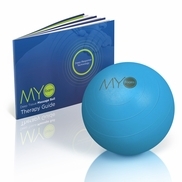 Advanced users can add resistance to most exercises by adjusting the grip position closer to the floor. By reducing your leverage, your challenge increases. Push Up Rings also add a new stability challenge and muscle growth potential to one of the best compound exercises, the Push Up. Add in the instability of the rings and you go one step further by engaging even more muscles in your chest, core, and shoulders giving you an even greater muscle building effect. If you still haven't tried the ring push up, you have got to today. All Ultimate Body Press gear is supported with our online workout guides, nutrition guide and YouTube channel. We provide the training you need to use your Ultimate Body Press gear effectively and add new workout videos each month to get you the results you want. We combine the benefits of Compound Exercises in Superset Workouts to keep you working a fresh muscle group while recovering from the previous exercise. Superset workouts further increase your metabolic muscle growth to get your the results you want fast. Make a massive impact on your home gym with one simple accessory, order your Push Ups Rings today. Push-up Rings Accessory5Don From Cape CodFebruary 17, 2014Great new addition to the pull-up bar and dip station I previously ordered from you. I'm now able to get so much more out of my workouts is much less time. Not bad for a 73 year old. Push-up Rings Accessory5ArminDecember 16, 2013New challenges from the ordinary pushups, and the range of exercises that can be done on the pull-up bar. Thanks for a great product! Push-up Rings Accessory4fiddledeeFebruary 23, 2013Glad I made this purchase. So easy to assemble and quick to attach and un attach to chin up bar. My only complaint is that I am a woman with small hands and I find the diameter of the rings a little too large for comfortably fit the palm of my hand. Push-up Rings Accessory5Kirk B.November 30, 2012Great product delivered on time at a fair price. What else could you want? Push-up Rings Accessory4MathiasOctober 10, 2012Perform pushups, rows, bicep curls, tricep extensions, etc. with varied percentages of your body weight. Adjust your posture to engage your core. 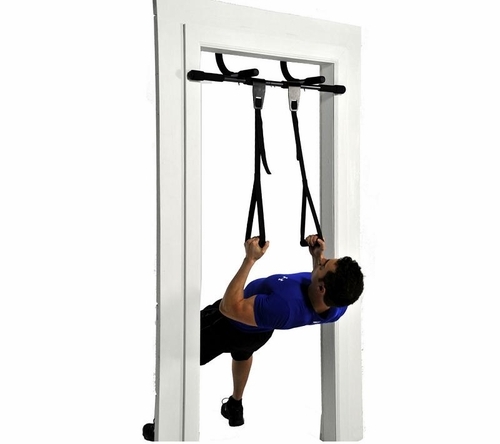 This product is an great addition to an over the door pullup bar and an excellent value. Push-up Rings Accessory5BryonJuly 26, 2012These rings are great not only for home workouts but also for my outdoor training. I could always find a place to do pull ups but was pretty limited on doing dips. Now I just throw these in my bag and can hang them from the same bars I do my pull ups on for dips and push ups. I highly recommend these rings! Push-up Rings Accessory5Will B.September 26, 2011Push Up Rings are an awesome companion to the Doorway Pull Up Bar for performing Dips, especially when workouts are limited to Hotel rooms. Push-up Rings Accessory5RyanJune 6, 2011I use these hanging from a pullup bar to do all sorts of suspended workouts and really like it. I'm still using 2 chairs for dips so maybe it's time to buy the dip station too. Push-up Rings Accessory5Mike FlinchbaughMarch 20, 2011Great product. Wish I had known about and purchased this product a long time ago. Pushups and dips are much more challenging with the rings. Thank you. Push-up Rings Accessory5VanessaMarch 2, 2011I get a great workout incorporating these push up rings! Push-up Rings Accessory4David from PhillyFebruary 1, 2011I like the product. Straps could be longer. Otherwise, sturdy and easy to use. Push-up Rings Accessory5Christopher KimJanuary 21, 2011These ab straps are amazingly easy to use, and offer a great amount of comfort and durability. Push-up Rings Accessory5Wayne StuartJuly 13, 2010Performs as expected. Look forward to see results of use in 3 months. Push-up Rings Accessory5Joe TunonMay 15, 2009These pushup rings give pushups a whole new meaning, as they work the arms and the core better than standard pushups. And check out the divebombers to really work the pecs and forearms. Kudos to whoever decided to turn dumbbell flies upside down so we could target the same muscles (and more) without the dumbbells! Push-up Rings Accessory4NYC - SmallGymMarch 11, 2009No Gimmicks. Not a losing money scam. 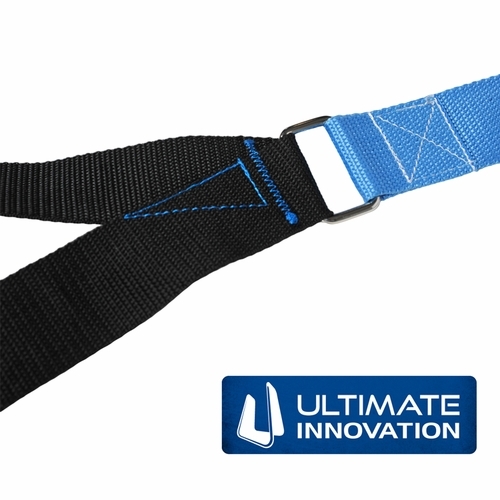 Ultimate Body has a great Dip Bar and added some additional exercises with the hanging handles. Using gravity and your own weight to build a great body and strength like a Gymnast and not a hulk monster. Push-up Rings Accessory5AlexanderFebruary 18, 2009For all of those that are into fitness magazines, I read this is one of the approaches used by the main character in the movie 300 for his fitness goals. I can't wait to get my hands of these Push up rings. Whoever's idea this was is a Genious!!! Question: What is the length? I have a pull up bar and want to know if they'll reach the floor.. Question: How long are the straps on the Push Up Ring 2.0? I am debating on them versus the standard rings with the 17 ft. strap for a wall mount bar. Answer: The Push Up Rings 2.0 are 7 ft long which is equal to a 14 ft strap for standard rings because with standard rings the strap is doubled up. One big advantage to the Push Up Rings 2.0 is the hook because to move traditional rings you have to undo the strap then re-thread it. Question: How much weight can they support? Question: What is the shortest length they can be adjusted to? Question: When will you have these available? I wanted to purchase this with the joist mounted pull up bar. Would it work out cheaper to buy them together? Answer: These will be back in stock on May 20. You will save about $10 dollars in shipping by purchasing the items together. 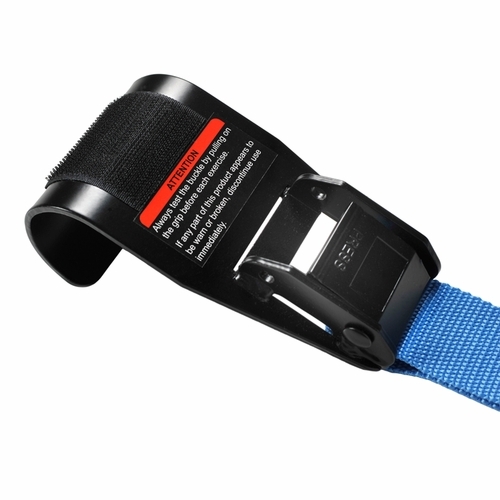 Question: i just received the push-up rings,my question is why is there another loop of material webbing another loop integrated into the handle? Answer: This is a foot loop. 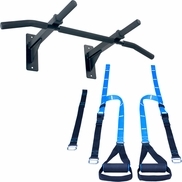 It is for use with a pull up bar. Answer: 300 lbs on each strap. Question: What diameter pipe the Push Up Rings supports? Question: Hello, I have previously purchased the prior version..one of the handles snap, making it unusable...does this new version have stronger handles? Please note I have also previously purchased the Body Press (Original Dip Bar) great piece of equipment and today (Sunday) have ordered the Ab Wheels. Answer: The new version has heavy duty molded handles that are virtually unbreakable. Question: Can you please create an instruction manual on how to safely secure the push up rings. Thanks. Answer: You can find the instruction manual and a video under the "Specifications" tab. 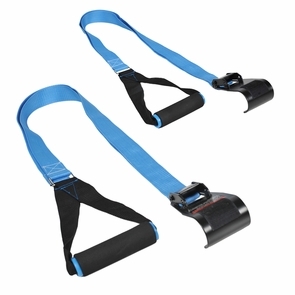 Question: Will these hang low enough off a chin up bar to do push-ups with? Answer: Yes, the strap is 7 ft long.